For this project, the client was moving into a new space in a high rise building in downtown Chicago. They wanted to furnish the space with brand new office furniture for the private offices, workstations, and conference room while still staying within their budget. The environment they were moving into was bright and had a lot of windows, therefore, keeping an open concept was very important to the client. 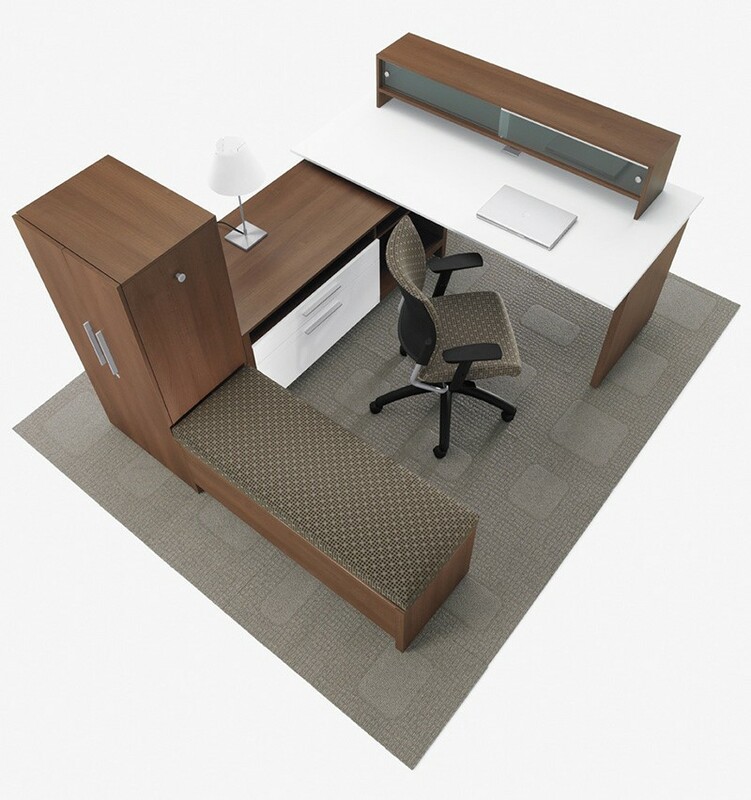 Starting with the open area workstations, we specified Global’s Bridges benching system. Bridges is a system that creates a sense of community without compromising privacy, making it excellent for open area workspace. The system is customizable with storage, privacy screens, and accessories. It is also available in many different laminates and veneers. 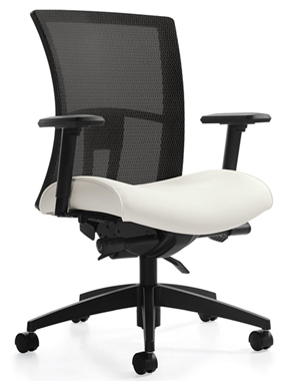 We also specified Global’s stylish and comfortable, Vion task chair for the entire office (available in a variety of fabrics). As for the private and executive offices, the client was looking for something simple and modern that coordinated well the open area workstations. For the private offices, we specified L-shape desks from Global’s Princeton collection with a great storage credenza and simple peninsula. For the executive office, we wanted to provide a bit more storage, so we specified a U-shaped layout (also from the Princeton collection) with a mixed storage module, wardrobe closet, and bench. We also included a coordinating conference table for small meetings. When it came to the conference room, the client wanted more of a training area rather than a traditional conference room. Their conference room would have a retractable dividing wall so they would be able to make two small meeting rooms. We needed something mobile, so we selected Global’s Bungee Flip Top tables as they are easy to move and easy to stow away when not in use. 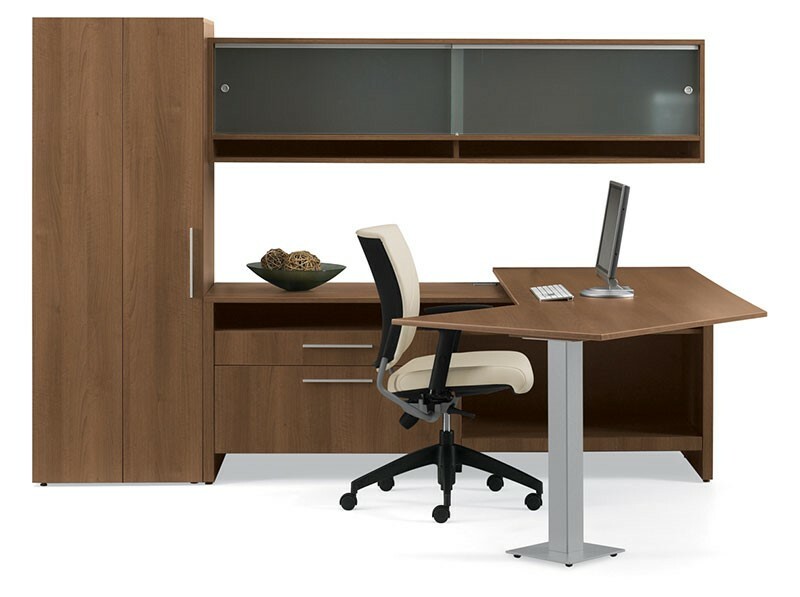 They also coordinate well with the Bridges workstations, allowing the space to be cohesive with the rest of the office. We also paired the training tables with the Roma Honeycomb chair (also by Global) which is mobile and easy to store.